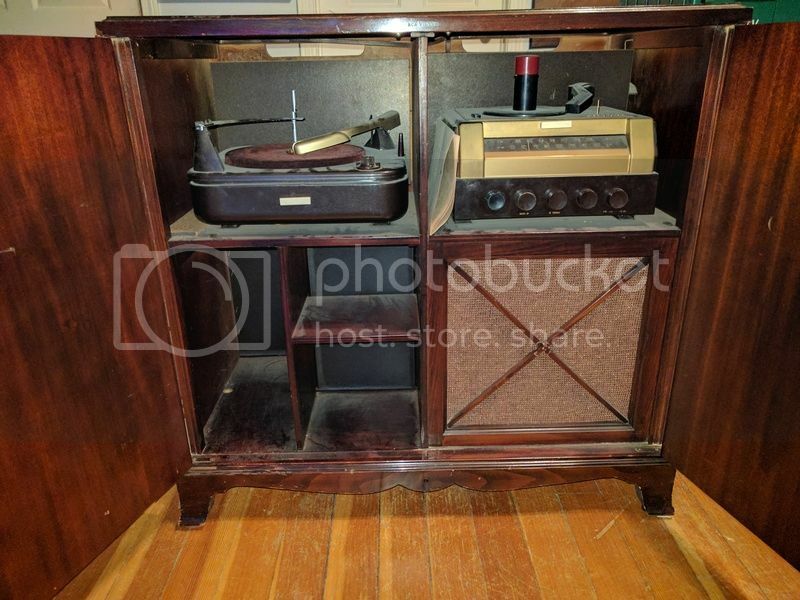 RCA Model A-108 restoration help??? My wife's mother is moving and she has been bringing home all kinds of stuff (read: crap). The exterior is in very good shape. However, the internal contents need some love. The left side is a 33/78 record changer (up to 12 at a time). The right side has another turntable that plays 78s (up to 12 also) and features a tuner as well. The speaker is below the 45 player. The unit powers on when plugged in. I turned on the 33/78 player and got nothing. I pulled the platter off and noticed it's an idler pulley that drives it. I lubed up everything that needed lube and turned it on at 78 rpm and eventually got the idler wheel spinning. However, I can't figure out how to put the platter back on with the tension of the idler wheel . The 45 side has no output at all. It powers up (the lights for the tuner come on), but no feedback. Just a few pops from the speaker when I move the tuner dial. The top of the 45 player lifts up and is not fastened to anything, other than a few wires. I can see the belt is all dry and gummed up. Anyone know of any tips for working on one of these? I haven't opened up the back yet, probably tomorrow. I know it's a bunch of tubes in behind the 45 player. Here's a bunch of pics, hoping to get some help from you guys on how to troubleshoot etc. 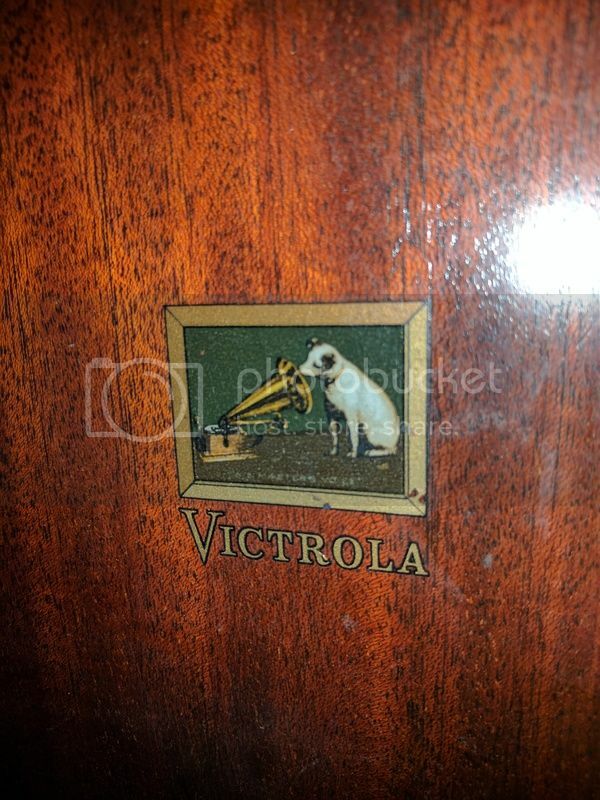 Re: RCA Model A-108 restoration help??? I've started cleaning and disassembly, but finding some issues. How do the sildes come off without unscrewing from the wood, which would require totally disassembly of each turntable. I also can't get the platter to seat fully on the 33/78 player. 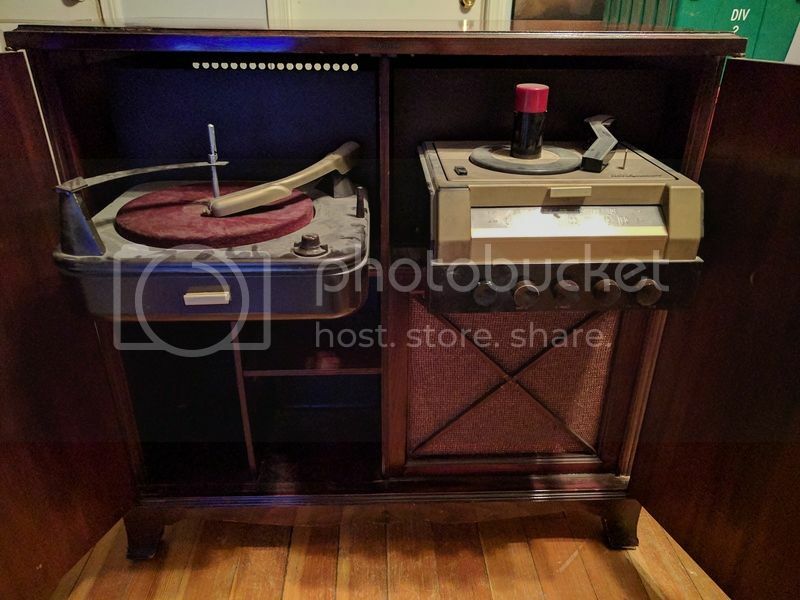 The key is lined up with the gear inside the turntable, what am I missing? I am not the RCA guru, but allow me to stick my two cents in. The turntable on the left probably plays the "big" records with a small hole. 33's and 78's. The one above the tuner plays 45's. My bet would be that both cartridges, the part that holds the needle, are dead. That is fairly typical of old record players. Fortunately, instruments like yours are plentiful and reasonably priced. You will need to go thru the electronics in the tuner/amp and replace all the capacitors, check the resistors and check the tubes and replace any that are bad. They made those basic instruments with a TV installed in the left side of the cabinet and put the changer under the TV. Those are good performers when you get them all tuned up. To address your question on how to remove the changers. That will most likely happen from the rear of the cabinet. Probably some kind of clips under the changer that need moved or removed to allow the changer to come out. Hopefully somebody with better information can help you more. Best of luck on your restoration. Thanks for your help. I've read that the carts can go bad over time. I was hoping to just replace the styli, but it doesn't sound like it's going to be that easy. There is no locking clip etc that I can find anywhere on the drawer slides. I install office furniture for a living so I have definitely removed hundreds of drawers from similar tracks, but not lock in sight on these. Larry, our resident RCA expert, should be able to answer any and all questions you have about this unit. The large changer is an RCA branded VM 950. You should be able to find a photofact for that changer online. The 45 changer is an RCA RP-190. The amp/45 changer comes out the front. You have to remove two cotter pins at the back of the track, and you can pull the changer and amp right out the front of the set. You may have to yank hard to get it out. I would suspect the large changer has cotter pins or something similar on the back of the track that have to be removed before it comes out. I haven't had one of these with two changers. The one I had only had the 45 player. It was a model 45W10. Here's the one I had. The track for the amp/45 changer is a two part track. One track stays mounted permanently to the wood cabinet, the other part of the track stays mounted permanently to the bottom of the amp. Do not remove the tracks from where they are. You can see from my last two pictures here that the one part of the track remains on the amp when it is removed. Wow Larry, thanks so much for all the tips thus far. I'll take a look tomorrow and see about the pins. I pulled the platter off of the VM950 and now I can't get it to go back on, even if I push the idler wheel in out if the way. I have the gear down inside the turntable positioned with the space in it so it will line up with the keyway on the platter. Still want seat fully. I have to get some replacement plastic spacers for where the motor mounts to the plinth, all 3 are broken and missing. Always remove and reinstall the platter with the selector on the neutral setting. Also, when reinstalling the platter, rotate it clockwise while pushing down as you rotate it. The idler has to pop in place to the underneath rim of the platter. Look down at the bottom of the spindle before reinstalling the platter and be sure the trip pawl (little finger that actuates the cycle) is pushed out of the way. You can push it out of the way with a small screwdriver. The platter gear may be hitting the top of the trip pawl, and that's why it won't go all the way down. Larry, you ARE the RCA man! Thanks for bailing me out. Here is your RP-190 changer photofact. There shouldn't be any plastic spacers. You need three cone shaped motor mounts, three flat washers, and 3 C-clips to secure the motor to the plinth. You really need 6 motor mounts, since both changers will need new motor mounts, and each changer uses 3 of them. My motor is held in with rivets. No C clips here. Just pulled the player apart and found the C clips underneath. The 2 brass sleeves are supposed to be slid onto the spindle before sliding the platter down? Thanks for the links, those will be a big help. Do rubber mounts place the mount for the motor flush with the bottom of the "plinth", or do they separate the motor mount from the plinth (this is what I assume). Tried the platter again and it still doesn't seem to seat all the way. Maybe it is, and it's just wobbly due to the motor being that loose. Doesn't seem right though. 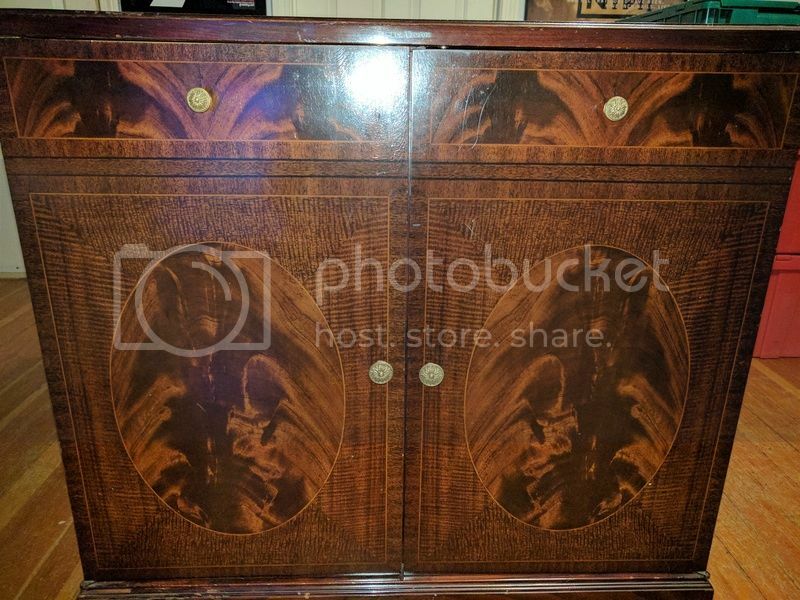 Does the platter drop down flush with the plinth? Does it sit up above the plinth so you can see most of the side of the platter? OK, I got the motor mounted. I had some rubber spacers that were the exact same dimensions, so it worked out perfectly. The platter is allot more stable, but still has a good warp to it when it spins. On the bright side, the 33 player is up and running pretty great. I pulled it apart and cleaned and lubed everything. How about a replacement belt for it. It's just the little belt on the 2 small pulleys. Also, what about the cart? Should I just replace it, or will just swapping the 2 styli/needles work out? Can't seem to find them for sale too many places.